This weekend in Windsor is set to excite as both Shakespeare and Eastern Europe collide. The Budapest Café Orchestra and Shakespeares Coriolanus will be gracing the doorstep of Norden Farm Centre for the Arts on 30th Jan and 1st  2nd February respectively. Traditional folk and gypsy music from Budapest, Hungary, will be performed by Chris Garricks lively and eclectic orchestra. As a professional jazz violinist, Garrick has performed with Dame Cleo Laine, Nigel Kennedy and John Dankworth. He will be joined by accordion player Eddie Henson, who has accompanied Luciano Pavarotti and Placido Domingo, and is also supreme accordion champion of Great Britain. Adrian Zolotuhin from Russia and Kelly Cantlon complete the group; together they recreate the magic of gypsy campfire music and the atmosphere of a traditional Budapest café. They will perform for one night only at Norden Farm on Thursday 30th January, 8pm. Tickets are £15 (£13 conc). In addition to this Eastern European show comes the home-grown talent of Shakespeare. The West End production of Coriolanus, starring Tom Hiddleston as Coriolanus and Mark Gatiss as Memenius, will be broadcast live from the Donmar Warehouse in Covent Garden. As one of Shakespeares lesser-performed works, this is an exclusive opportunity to enjoy the blood-soaked tragedy, set in Rome against a backdrop of political manipulation and revenge. Interesting parallels are drawn between this ancient society and the public figures of today, comparing public and private identities. National Theatre Live offers a unique chance to enjoy the best London theatre at home. 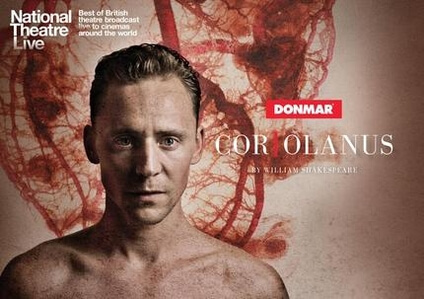 Coriolanus will be broadcast on Saturday 1st February, 8pm, and Sunday 2nd February, 2pm. Tickets are £15.